Interesting: that bio mentions the "mood slime" from Ghostbusters 2, but this is clearly a Ghostbusters 1 toy. He's wearing the same chest cap as Egon (as opposed to the versions worn by Ray and Winston), but it's been given a solid green paint app to make him look like he's splattered with slime. He has the same hair piece as the rest of the Venkmans (Venkmen? ), but his face shows fear, an expression that is both new and appropriate. 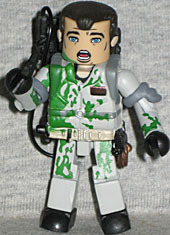 He comes with the proton pack and orange/blue energy blast, of course, even if he never fired his gun in the scene. He does have a removable radio on his belt, though. 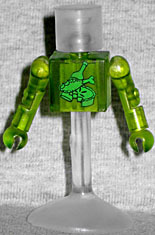 "Clear Slimer" was one of the first Ghostbusters Minimates released at Toys Я Us, and consequently, one of the hardest to find. He was later re-released in a "best of" assortment, and that's when I picked him up. That will matter later. 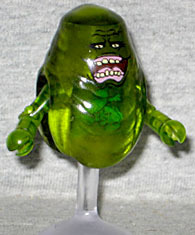 Slimer is cast from translucent green plastic - or more accurately, from clear plastic that's then been given a thin coat of green paint. His body is a single spud-shaped chest cap, leaving only the standard Minimate arms exposed. He floats through the use of a clear stand that plugs into his waist hole. When Art Asylum went back into production for the Best Of series, they had a chance to tweak some things about the figures, like changing Louis Tully's nametag to a movie-accurate "Spengler". For Slimer, they made his face smaller, and added a paint app that was supposed to be on the original release but wasn't: a deco of food resting in his spectral stomach! There's a drumstick, a pie and a bottle of wine, painted in solid green so they don't look out of place. You can see them through Slimer's stomach, but if you don't want to, just turn the torso block around and it will be hidden. Nice! I didn't get the the Venkman/Slimer set the first time it was out, so either I passed on it, or never saw it. Either way, that turned out well, since the "best of" release gets the paint apps the first version was missing.